I like to think of myself as a fairly open minded eater. I enjoy ethnic restaurants and cooking with new ingredients. 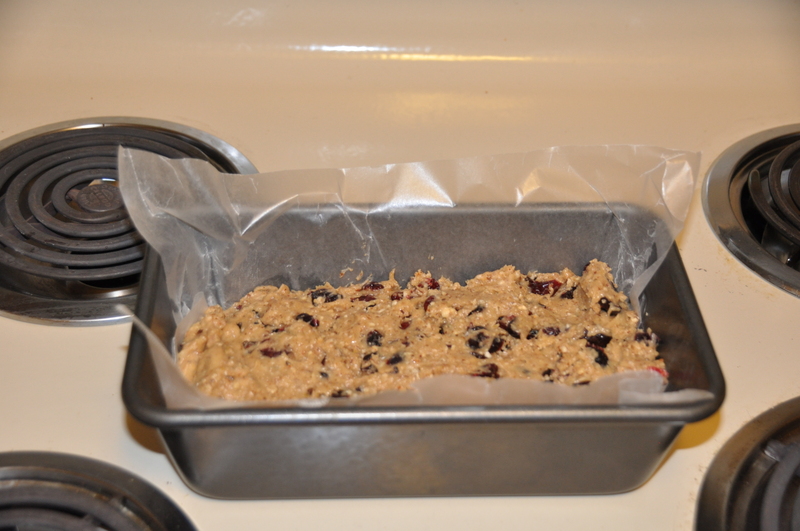 But the Brooks Bakes Project has taught me that when it comes to dried fruit, I’m downright picky. I already knew that I despised raisins, but I learned that I also don’t like prunes, apricots, currants, or candied pineapple. 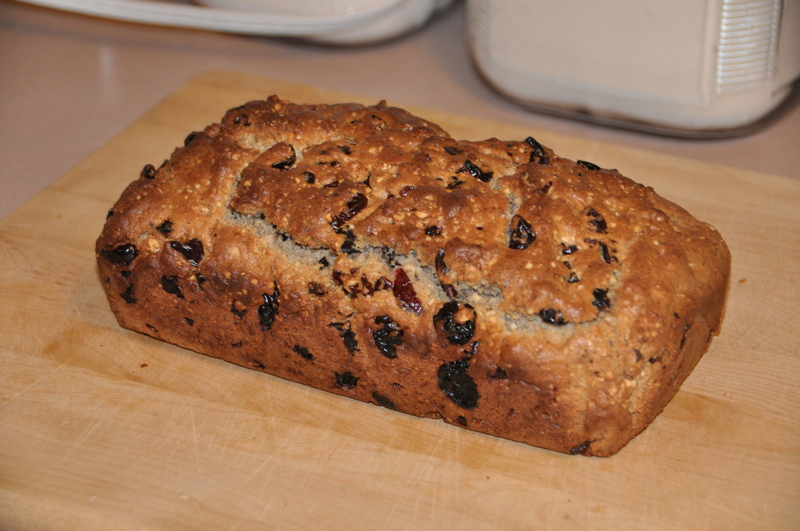 Since I wanted to enjoy my Pain de Fruits, I modified the recipe, replacing the figs, candied citron, and raisins with dried blueberries, cranberries, and cherries. Beat eggs and sugar together. Add the flour, baking powder, cinnamon, salt, and melted butter and mix well. Grind the hazelnuts and almonds in a food processor until they form a coarse powder. Add the ground nuts and blueberries, cherries, and cranberries to the batter and blend well. Line a 9 x 5 inch bread pan with wax paper and grease the ends. Pour the batter into the prepared pan and bake in a preheated 350 degree oven for 50 minutes, or until a toothpick inserted in the center comes out clean. Pain de Fruits is an unusual bread, since about half of the “flour” is actually ground nuts. This gives the bread a drier, crumblier texture that the typical quick bread, but it also provides a delectable, mildly nutty flavor throughout the loaf. 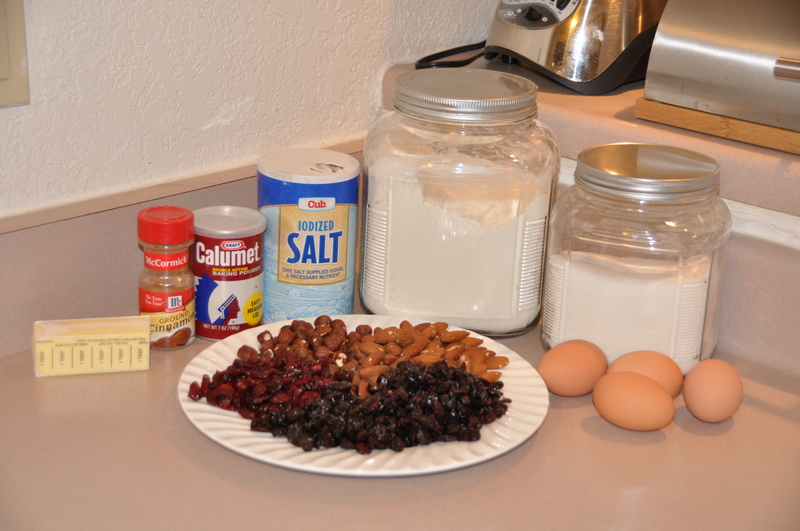 I thought my dried fruit mixture of cherries, blueberries, and cranberries was delicious, but definitely experiment and find a mixture that tastes good to you. Maybe you’re a bolder person than I, and want to try the figs and candied citron.